The weather is changing. Fall is closing in. Summer gatherings have begun to fade. But fear not, there is still plenty of gathering left to do through the remainder of the year. One of our favorite holidays here at Everybody’s Hungry coincides with this transition and brings families and friends together. With a fun gobble and visions of pumpkin pie in my mind, I speak of Thanksgiving. There is a warmth and comfort that I’ve come to know during Thanksgiving. Even the name of the holiday signifies an appreciation for what you have achieved throughout the year and the blessings acknowledged. In the same spirit and an effort to not only give thanks, but to simply give, Everybody’s Hungry is announcing it’s first promotion, “Calling All Turkeys!” One of the goals of the blog is to help bring visibility to our grass-roots donation effort through the Share-A-Bite program and encourage others to do something in their community as well. In order to expand that exposure, we need followers. From now until Thanksgiving we are asking our faithful readers to help spread the word about Everybody’s Hungry and increase our readership. If we are able to increase the number of people following the blog, we’ll donate turkeys to our partner, FOOD Share, so that others will also be able to enjoy the holiday well fed. To add a little flair to the promotion, we enlisted the help of my 2nd cousins during my grandmother’s 90th birthday to create hand turkeys. The enthusiasm the kids displayed was refreshing. Hopefully the photos make you smile and provide a little inspiration. *In the spirit of giving and the encouragement to share, I challenge all of you as loyal followers of Everybody’s Hungry to match our donation in some form or fashion. If we meet our numbers before Thanksgiving, consider also donating to a family, church, shelter or food bank in your area. Every act of generosity makes a difference, be it a turkey, side dishes, money or time. Reach out to the members of your community and show how thankful you are this season. Special thanks are due to the following people: Danielle, Avery, Ellery, Dylan, Brogan, Kyleigh, Carter, Elena, Elliott and Tatiana for your creativity; my father and wife for your keen, photographic eyes; my mother, who served as supplies procurement, craft director and personal assistant to many of the turkey’ers. 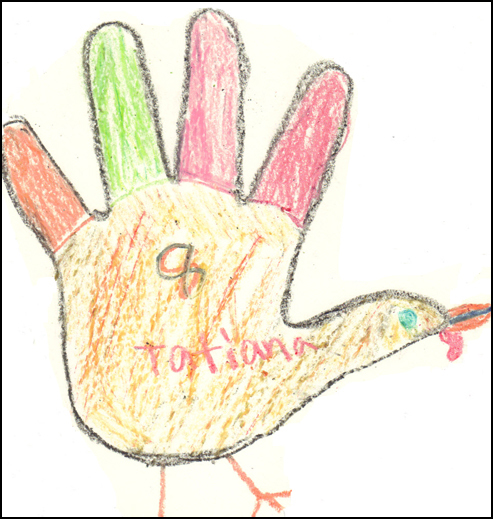 Gallery | This entry was posted in Promotions and tagged Crafts, Donation, Thanksgiving, Turkeys. Bookmark the permalink. This is one of the best yet. To help someone else, count me in. We all can make a difference for some family in need this season and give back for all we have that others may not. There were friends and relatives that came in from 9 different states for my mom’s 90th birthday party. Think about it, 9 different communities, at least, that we can all help at one time. You can see the enthusiasm of these kids having fun, making those hand turkeys, getting involved………..Let’s share that enthusiasm and accept this challenge. Danielle- it was too much fun making the turkeys! i was glad to help!! good luck! !